I had the pleasure of spending a day at WALCA in Bexley, NSW, last week. There were many things about the service that make me suggest they are approaching best practice. Most notable was their InterCom service in IGLO:). This part of the day service included two staff dedicated to supporting the communication of the service users. The staff had built particular expertise in Intensive Interaction and other communication strategies. 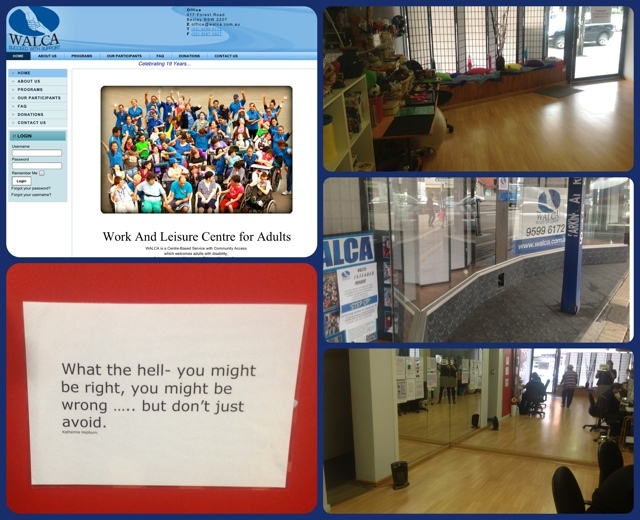 They had an area of the day service where they could bring clients for one to one work. In addition, they had other staff spend a day in the part of the service so that they could model and share what they’d learnt. They showed and discussed a video that they had made of the work. They impressed me with their ability to describe the outcomes for service users and how these had been bought about: people who were now taking turns in sound play, people who had started the service screaming most of the day and now smiling in interactions… Very impressive, and showing the value of day services when time is dedicated to staff learning and nurturing their ability to bring about and describe outcomes.